So, it has been a pretty good but weird year for me. I started out blogging on a daily basis on this blog, before winding down to 1 post per 3 weeks routine. It's pretty crazy, I tell you. On one hand, I wanted to continue blogging daily here. But yet, my work schedule is kinda bleh to prevent me from doing so. And since this year is ending, I'll start off 2014 with regular blog posts once again instead of trying to fit in a new blogging schedule out of the blue. Since my work schedule is pretty much going to be closing shifts mostly, I figured that I would blog after I get off from work. In other words, after midnight everyday, Singapore time LOL I know this sounds hilarious at some point. But if you were to look at this from various points of view, it might work out somehow. If I were to blog after midnight in Singapore time, this ensures that my local a.k.a Singapore readers would always get a fresh post waiting for them every morning. Or afternoon, if they hold a shift job. And for overseas readers, and depending on the timezone they are from, it will either be a fresh blog post for the start of the day or a fresh blog post to round off the day. And as usual, samples and freebies received/redeemed posts will still stay on a end-of-the-month post basis. Since at the start of each brand new year, it will either be samples and freebies galore or not much at all. So, I wouldn't want to chance it with the old weekly post, but links to freebies and samples will still be shared via my Facebook page so you won't miss out. 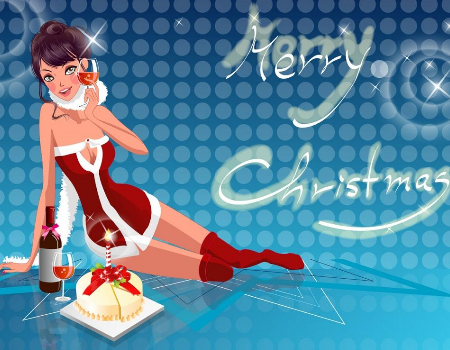 Those that I managed to find out and happened to last for another day or less, I'll gauge to see whether it might still be worth sharing although I hope my readers will get to know about it so they can get their hands on some free goodies to use and try out. 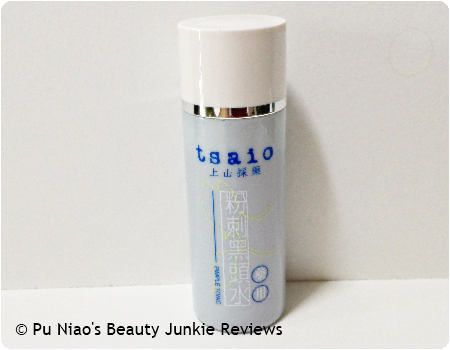 Tsaio Pimple Tonic: Contains Salicylic Acid, a moderate peeling agent that helps soften and purify cuticles for velvety smooth skin texture. Blended with various botanical extracts, it does not leave any unwanted tightness. So far, I've only used this when a brand new pimple is about to make it's appearance on my skin and needless to say, it's not as if it was only 1 pimple every 3 months. Regular readers would have known about my skin troubles after using The Body Shop's Tea Tree Oil. In other words, I'm getting pimples on a really regular basis. Therefore, I religiously applied this before the dreaded pimple gets any redder and obvious on my pale and ghostly skin tone and when the pimple finally decides to ripen after making it's grand appearance. And I'm proud to say that this product... doesn't seem to work for me at all. In fact, cheaper off-course alternatives such as the Nexcare Acne Patch seems to be working better instead of this product that actually supposedly helps directly. 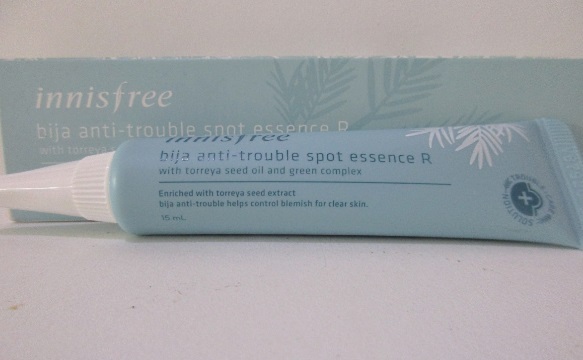 You see, I have a feeling that this product makes my pimple(s) behave indecisively after application. Sometimes, my pimples really decide to have a life of it's own and decide to make me suffer by slapping concealer like a maniac just for the sake of covering up the redness that shows on my skin. The possible only saving grace is that it actually helps "cool" the burning sensation I get when a pimple is starting to get red and angry. But other than that. I don't even know how it's "peeling" properties is supposed to help when a pimple is fast approaching to "eruption" although I can attest to the fact that the skin around and on my pimple doesn't feel so tight and taut that it hurts. WHAT I THINK: Helps cool the burning and painful sensation you feel when you have an angry red pimple on your face, but other than that, it doesn't seem to do anything positive at all. WHERE TO REDEEM SAMPLE: There's no sample sachets to bring home and try. Although on the contrary, you can pop down to the nearest Beauté Spring outlets to try their sample bottle instead. 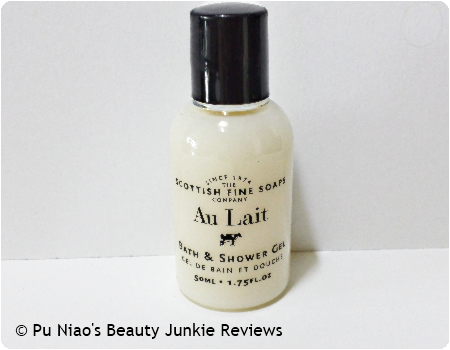 Scottish Fine Soaps Au Lait Bath & Shower Gel: A creamy foaming gel with added Vitamin E, suitable for use in either bath or shower and scented with the signature scent of Au Lait. Gel like texture with a watery consistency, the scent was simply milky goodness at it's best! VERDICT: The scent of this bath & shower gel is so milky good, it's almost akin to showering/bathing in actual milk. The texture is gel-like but the consistency is watery, like what bath & shower gels are supposed to be, and despite being a watery-esque shower gel, I found that it suds up very well and at the same time, I didn't have too much trouble washing it off either. For the uninitiated (me in particular), Scottish Fine Soaps is a Scottish based manufacturer of bath & body products established in 1974. 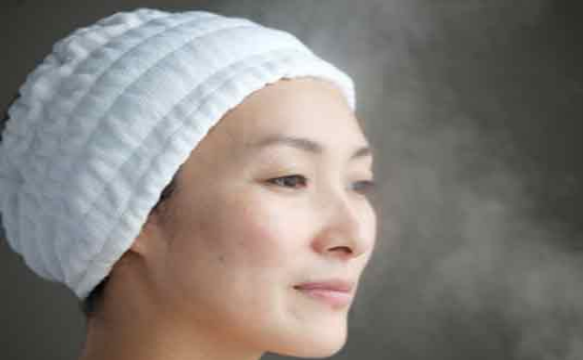 Founder, Derek Ross initially set out with the ambition to become a superb toiletry manufacturer, creating products which promote well-being for the mind and body. And because the company is based in Scotland, which is one of the most beautiful natural environments on the planet, hence their focus has always been on quality, luxury and heritage, Scottish Fine Soaps are committed to doing all they can to ensure it remains that way. And honestly, this is the first time I've encountered, tried and tested au lait a.k.a milk-based shower products throughout my 30 years of existence in life. If only this brand is readily available in Singapore, we can all be Cleopatras-waanabe, showering with milk (well, almost) on a daily basis. And yes, I found it a shame that there is no flagship store in Singapore at all. The shower & bath gel doesn't irritate my sometimes sensitive skin at all, and even hours after using this in the shower, I still encounter no after- and side-effects from using this on my skin. Safe to say, this is definitely a good choice for some of us who might have sensitive skin and cannot stand using the same soap bars as the rest of our family and/or cannot handle ordinary run-of-the-mill mass-produced shower & bath gels. Definitely a god-send from this product. And after washing the suds off my skin, my skin doesn't feel as if there's a layer of shower gel residue clinging to my skin too unlike various shower/bath gels I've tried and used before. And the best part? My skin actually felt softer after a few uses, something that I don't experience when using other bath & shower gels at all. WHAT I THINK: It isn't that hard if you want to be a Cleopatra. Yup! 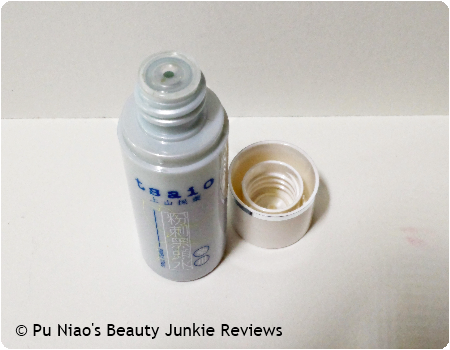 WHERE TO REDEEM SAMPLE: I got this sample travel-sized bottle in my Vanity Trove box that I received last year (2012) in August. I would actually suggest buying the shower & bath gel and/or body butter to try it out first before deciding on getting the entire range. At least if it doesn't work out for you, you can still give it to a friend. But since my sometimes sensitive skin can get really cranky without warning, I find that this product works just well for me. 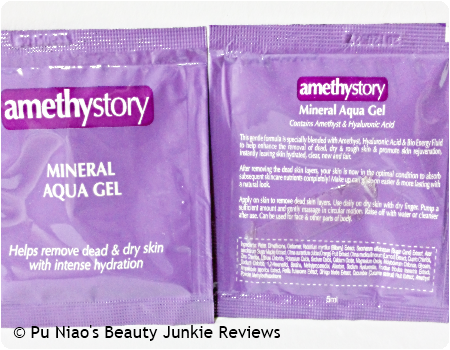 AmethyStory Mineral Aqua Gel: No colouring, no fragrance, this gentle formula is specially blended with Amethyst, Hyaluronic Acid & Bio Energy Fluid to help enhance the removal of dead, dry & rough skin & promote skin rejuvenation. After removing the dead skin layers that form a barrier, your skin would be in a optimal condition to absorb skincare nutrients! Smells pretty decent and doesn't feel sticky upon application at all. VERDICT: First to start off things, this Mineral Aqua Gel from AmethyStory has no significant scent, just that it reminds me of clean and fresh, that's all. I personally don't think I am a stickler for scented facial products unless it's Green Tea, Tea Tree and the likes. Anything else would just be a tad awkward unless the scent is literally to-die-for. 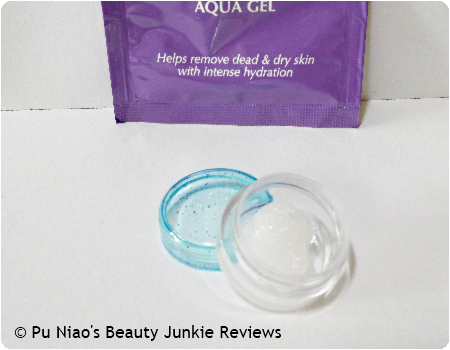 I still remember previously when I review the Natural Aqua Gel Cure and I personally still think in terms of after-usage, Natural Aqua Gel Cure seems slightly better although price-wise, AmethyStory would be cheaper. 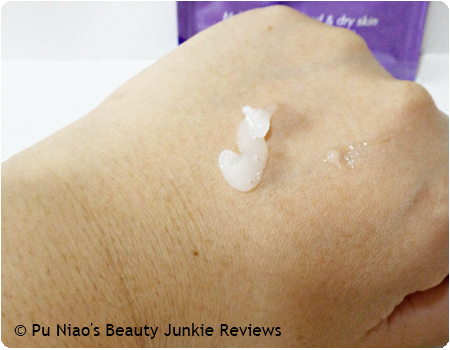 AmethyStory Mineral Aqua Gel is actually milky-white in color and the product has a gel-like consistency to boot. So, I won't be surprised if you got the sample version and found out that it starts to harden a little if you forgot to use it for a week or 2 after transferring it from the sample sachet to a reusable container/pot. Mine's starting to feel like hair gel somewhat, and I don't really want to know how much more it can harden if I leave it any longer. But when it's time to wash off the after-math of the product and the white wet flakes off my face, I seemed to have encountered a slight problem. It took a few washes before I can totally wash off everything on my face. Seems like those wet flakes refused to budge and get off my skin upon initial face washing, and subsequent washing doesn't seem to totally help. I ended up having to grab a tissue to swipe off the leftover flakes off my face. Sometime an exfoliator shouldn't do upon after usage, don't you think so? 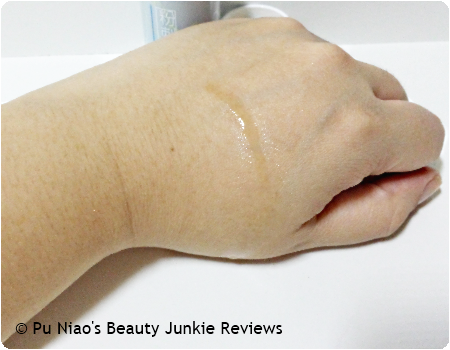 In terms of usage, this product doesn't seem to fare so well although the price is definitely cheaper than the Natural Aqua Gel Cure though.